The Aztecs were known for their astounding levels of wealth and tremendous amount for gold and jewels, so there really is no wonder that Big Time Gaming decided to base Temple Quest Spinfinity on these ancient people. Thanks to its optimized mobile and desktop design, you can play new online slots when you are on the move so that you have the chance of uncovering treasures wherever you may be. Spin the reels and see what the Aztecs have in store for you. Big Time Gaming are based in Australia and have been in business for just a few years, but that short period of time hasn’t held them back. Their company leaders each bring years of experience with them to the table, and this all shines through in their games. Even though they only offer ten casino slot games at the minute, each one is made with an extremely high level of expertise and attention to detail. If you enjoy this slot, why not try Danger High Voltage here on Wizard. 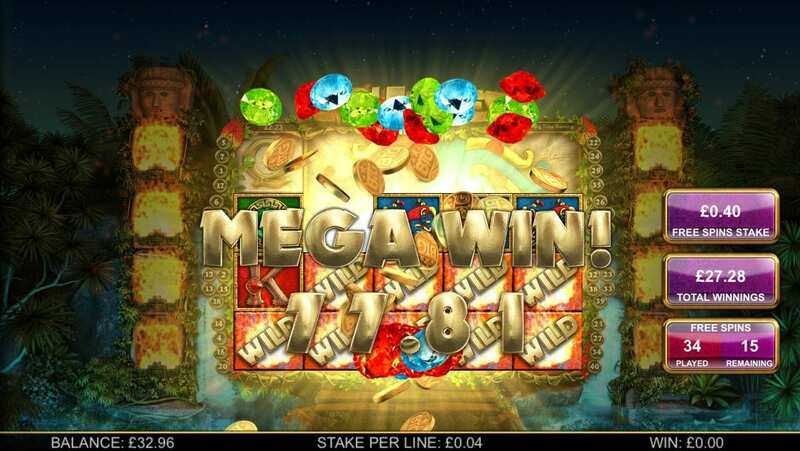 With five reels and forty pay lines, you’ll find that there are ample chances of winning on this game. And there’s a very pretty setting in which to play too. You’ll be playing right in the middle of a jungle. It’s a pleasant scene with waterfalls and lots of greenery, and two very impressive statues stand at either side of the game board. The board itself is one large stone tablet split up into the different reels. The large, golden game logo sits atop it. We recommend you check the best UK online slot games from our guide before you start playing. There are a number of colourful symbols carved onto each square on the reels. Even the lower-value symbols – the letters and numbers – are decorated with precious gems and jewels. However, the best symbols are those that are extremely ornate. You’ll see the golden god’s heads, large green jewels taking up their own square, and bright Amazonian birds. There are some other symbols that you need to be aware of. 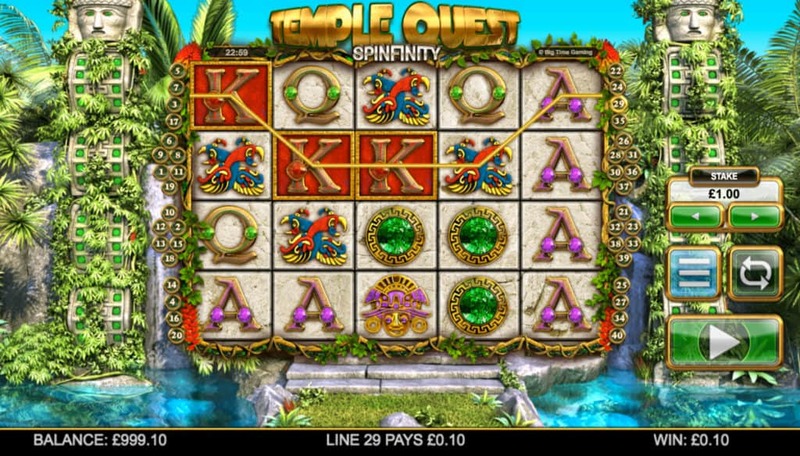 * WILD SYMBOL – Temple Quest Spinfinity’s Wild symbol is very easy to spot. It’s clearly labelled with “Wild” across it. This can replace any non-bonus symbols on the reels. Plus, it can expand along a whole reel, helping you win even more. * SCATTER SYMBOL – You’ll also see that some giant symbols sometimes appear and help you match more along the pay lines. When the huge green gem lands on the board, you’ll unlock the Free Spins bonus round. The number of freebies you get will depend on how much of the large symbol is on the board.